Support our emergency appeal for the Philippines. Struck by an average of 20 typhoons a year, the people of the Philippines know how to prepare for wind and rain. Within the last three years, at least one strong typhoon a year has wreaked havoc and claimed thousands of lives across the island nation. Super Typhoon Haiyan, which barrelled through central Philippines on November 8th 2013, was different. Seaside communities in Leyte, in eastern-central Philippines, bore the brunt of Haiyan’s onslaught. No one expected the flimsy, plywood-and-corrugated-metal homes of low-income families to withstand a strong typhoon’s winds, and the people of Leyte prepared accordingly. But Super Typhoon Haiyan brought a danger that was beyond the Philippines’ experience: storm surge. The storm surge brought tsunami-like waves the size of two-story houses. Many residents of Leyte, anticipating strong wind, heavy rain and some flooding, braced for the storm inside more permanent structures such as public school classrooms or neighbours’ concrete houses. Unfortunately, many Filipinos lost their lives in these buildings, drowned or carried away by the storm surge’s raging waters. The storm surge may account for most of the more than 6,000 lives lost, but in the weeks and months following the typhoon, the absence of water — clean, potable drinking water — threatened to prove as deadly. 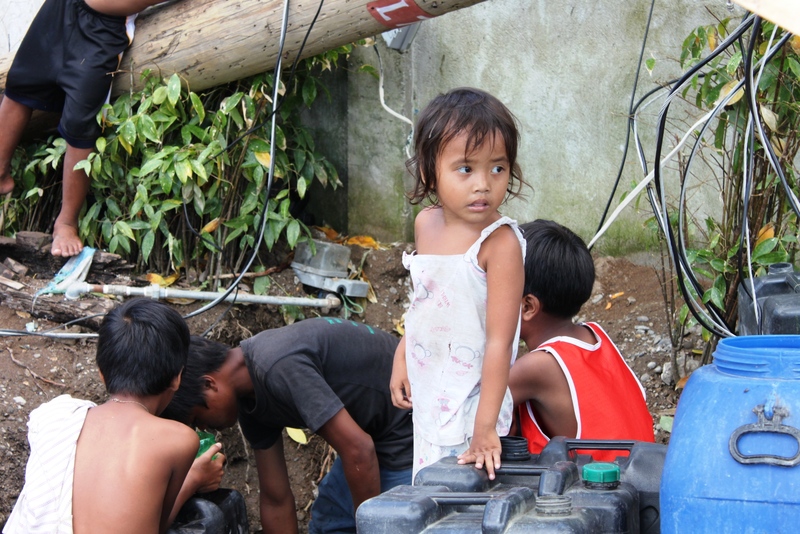 Water utilities throughout Leyte Island, like electricity and communications, had been disrupted by the storm. 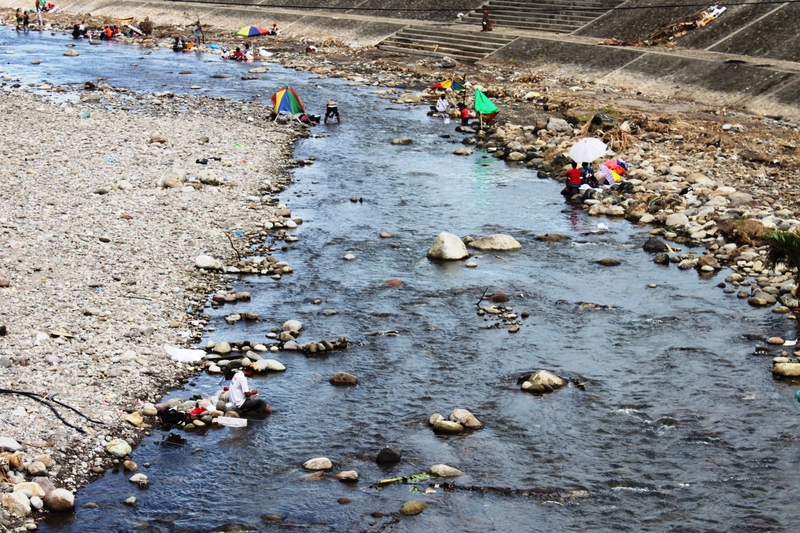 People use the river as their main water supplying for cooking, cleaning and washing. At first, affected families, many of them camped out in the ruins of their homes and many more packed into the hundreds of public facilities designated as evacuation centres, relied on drinking water supplied by relief responders. ChildFund provided 360 metric tons of food packs that included bottled drinking water. 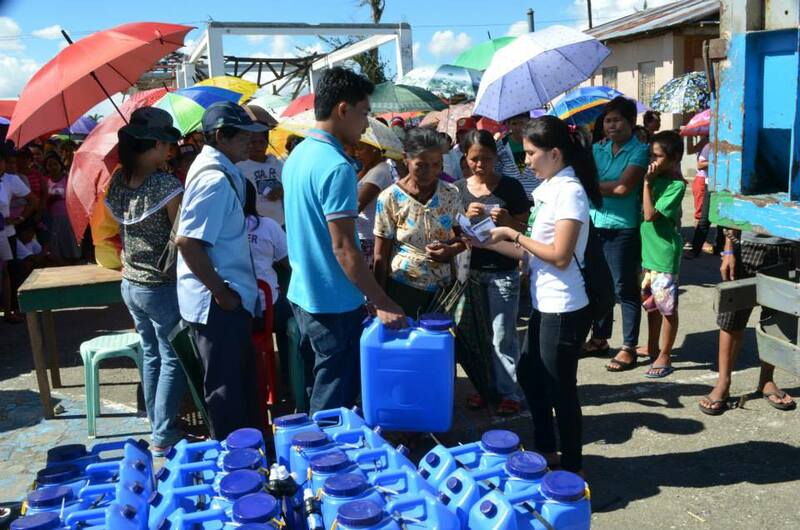 This was an urgent and critical intervention, especially at a time when the most basic necessities were scarce, but as we dug in for the long-term investment in the Haiyan response, we had to explore more sustainable solutions to Leyte’s lingering water woes. ChildFund staff and volunteers distributed jerry cans with water filters installed. 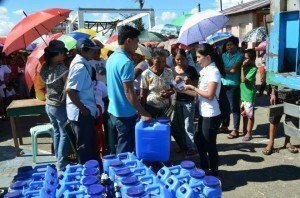 ChildFund began a longer-term intervention to provide safe drinking water in the municipality of Palo, just south of Tacloban City. Laid flat by Haiyan, Palo looked as if it had been bombed. ChildFund’s responders estimated that 62 percent of Palo’s surviving population had access only to open wells for water, the safety of which was questionable even before the typhoon. Now these open wells posed huge health risks thanks to the debris, pollutants and possibly cadavers carried everywhere by the storm surge. Another 18 percent of Palo’s residents had access to deep-well hand pumps, which were less likely to have been contaminated in the storm surge, but their water had never been any good for drinking in the first place. 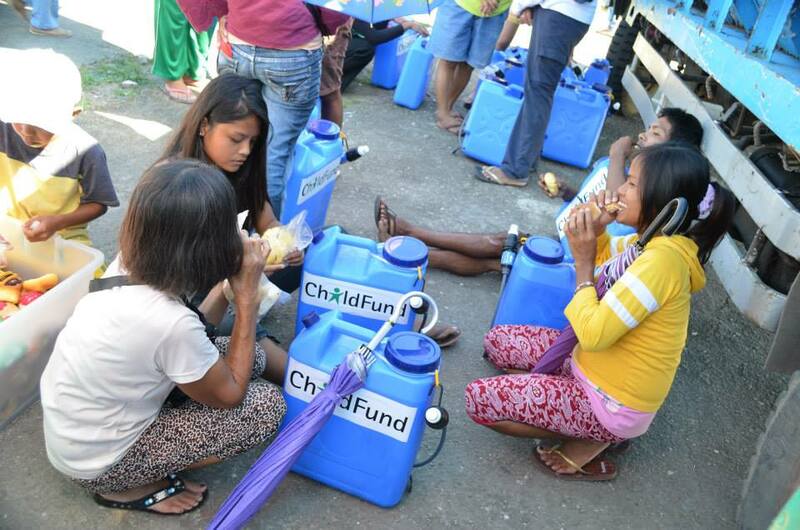 In December and January, ChildFund provided 500 families in Palo with water purifiers. These families were selected based on their degree of access to water — families that depended on the open and deep wells. Each of these jerrycan-type containers has a filter installed in its neck. As families fill the container from available water sources, safe, potable water collects in the 20-litre container. ChildFund is now also in the process of delivering and installing larger water purifiers to serve communities, not just individual households. The Philippine government and the private sector are hard at work restoring utilities in typhoon-devastated Leyte. Mobile telecommunications coverage has been largely restored. Electricity has reached most towns and municipalities, though coverage has yet to reach the interiors of these locations. Water utilities are also being restored. 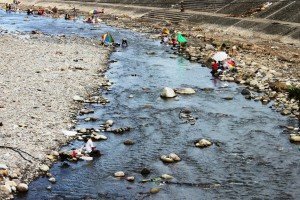 It will not be a quick recovery, but ChildFund hopes providing effective and sustainable medium-term measures will tide communities over, restoring water’s life-giving reputation in a place where water has caused so much harm.